Sometimes Ben makes quick French toast for the kids for breakfast on the weekends. He makes it with the whole wheat bread we always have on hand. I love that he does this for this for them, but I always decline to eat it myself. Why? Well, because I’m a French toast snob, of course. Honestly, I usually eat a pretty healthy breakfast. It typically goes downhill from there, in terms of healthy eating, but that’s a different issue altogether. Not that French toast made with whole wheat bread is unhealthy, I just typically go gluten-free at breakfast. Except when I don’t. I’m very consistent like that. But if I’m gonna eat French toast for breakfast, it’s gotta be the real thing. Soft, fluffy white bread, lots of cinnamon and vanilla. Bonus points for fresh fruit and good grass-fed butter. 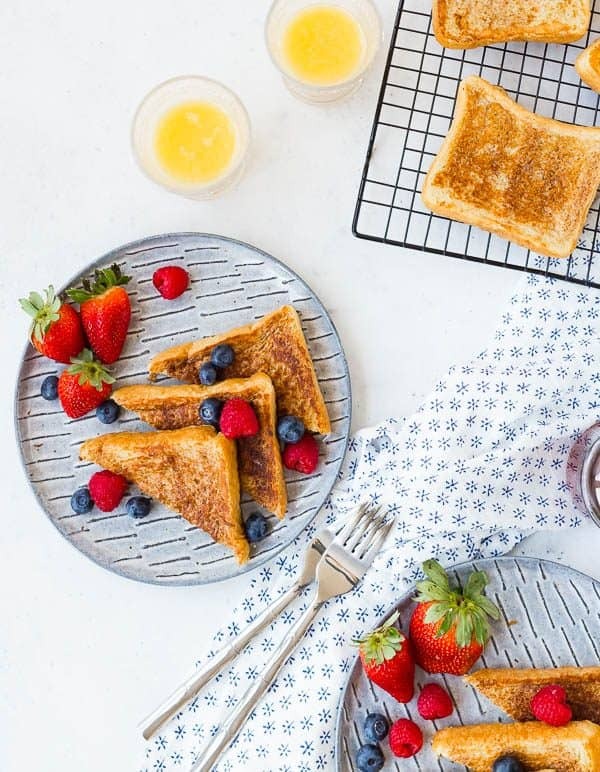 My go-to bread of choice for this French toast recipe is Texas toast. 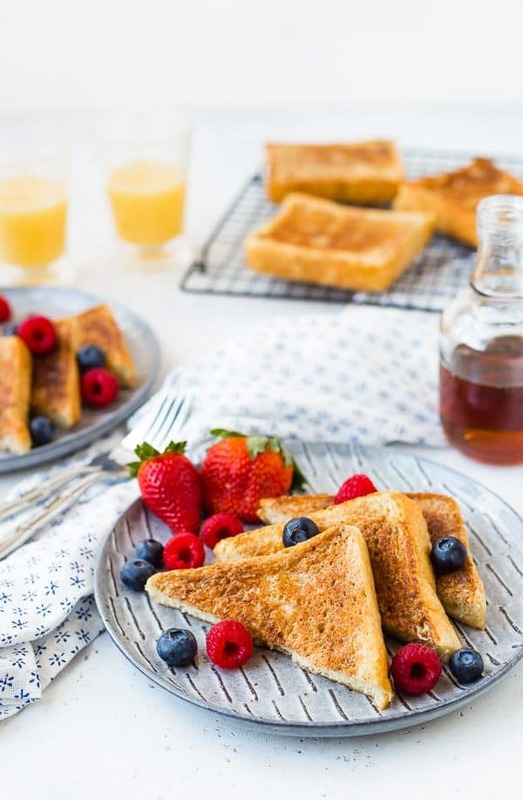 Perfectly soft, and the classic square French toast shape. It’s unmistakable in appearance, and perfect in taste. It soaks up the eggs and milk perfectly and cooks in just the right amount of time. Tip: Want to get a little fancier? Try sliced Italian bread, French bread, or even better, challah or brioche! Yum. Just keep in mind that cooking time might vary slightly based on the thickness of the bread. So here’s the thing about French toast. I have a few pet peeves. I’m pretty easy going in general (maybe Ben would disagree), but when it comes to French toast, things just have to be a certain way. We already talked about the bread, but let’s talk about some other must-haves for the best French toast ever. I know we already talked about this, but it’s so important. Get yourself some fluffy, soft, tender white bread. It matters. Texas toast, Italian bread, French bread, challah or brioche are all decent options. If you can get some really amazing, thick-sliced cinnamon-swirl bread, that’s also an amazing option. Don’t slack here, you guys. I don’t want you to see any components of the egg white or the egg yolks in this mixture. You must beat this together until it’s perfectly combined and uniform. Does it take an extra minute? Yes. Might your wrist or elbow get a little tired? Yes. You can deal. Otherwise you’re gonna end up with something that looks like a mini fried egg on the outside of your French toast, and no one wants that situation. Okay, time to get serious. Have you all made French toast where you mix the cinnamon into the egg mixture? And then you end up with little clumps of cinnamon, most of which end up getting stuck to the edges of your bowl instead of even going on the bread? This is not good and not what we want for the perfect French toast. So this recipe does it a little differently. We’re not going to put cinnamon or sugar into the egg mixture. Instead, we’re going to dust the outside of the bread with it before we dip it in the eggs. It’s a genius tip that I can’t take credit for, unfortunately. I learned it from Lauren when I made her Chai French Toast Skewers. 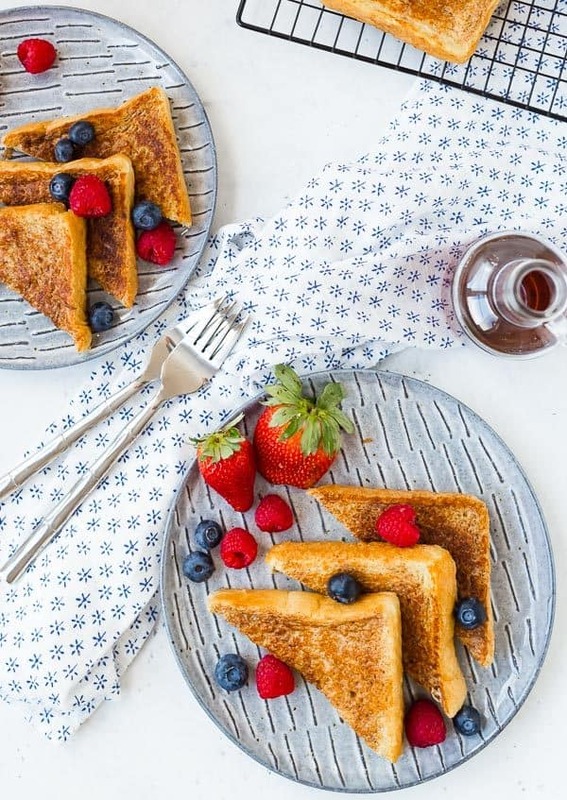 This dusting of cinnamon and sugar not only adds just the right amount of sweetness and spice to every single bite of French toast (no clumpy cinnamon here!) but it also creates an amazing caramelization on the outside of the French toast. 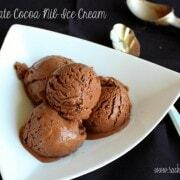 It’s completely irresistible and a total game-changer. Now, I know this is a very personal matter. 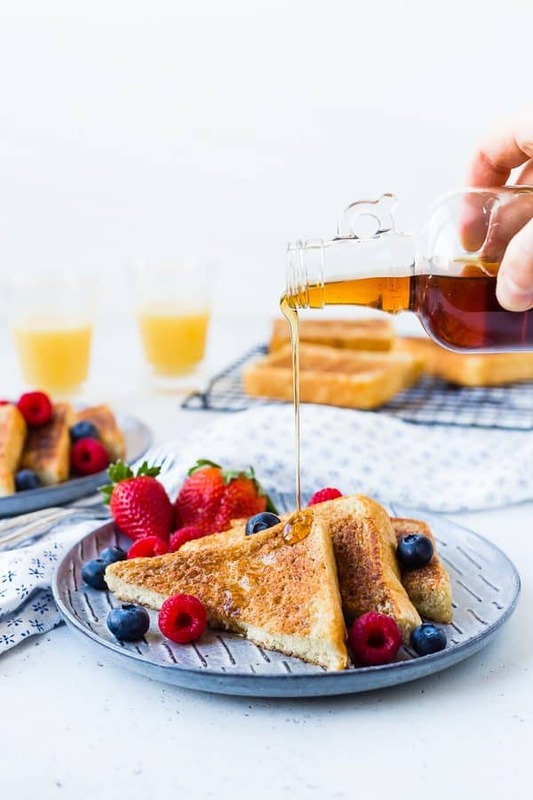 I recently tried Trader Joe’s vanilla bean maple syrup so lately I’m loving a drizzle of that plus a handful of fresh berries on my French toast. I grew up eating a mixture of butter and brown sugar on my French toast, and you really can’t go wrong with that, either. Maybe you like a strawberry sauce, or whipped cream, or just a light dusting of powdered sugar. I might have strong opinions about cinnamon and bread…but when it comes to toppings…make it your own! Go crazy or keep it simple, you’re the boss! 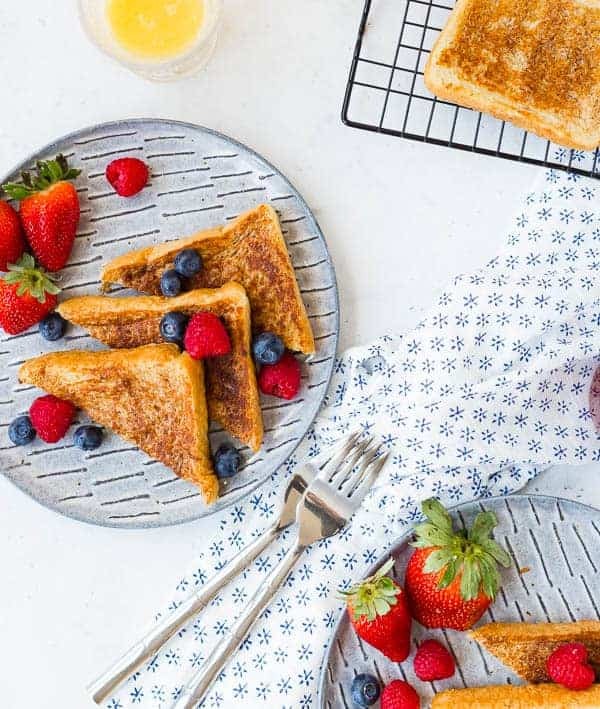 Ready to take your French toast game up a notch? 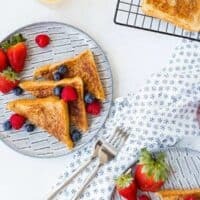 Try grilled and stuffed French toast! Its so fun and the smoky flavor from the grill is irresistible! 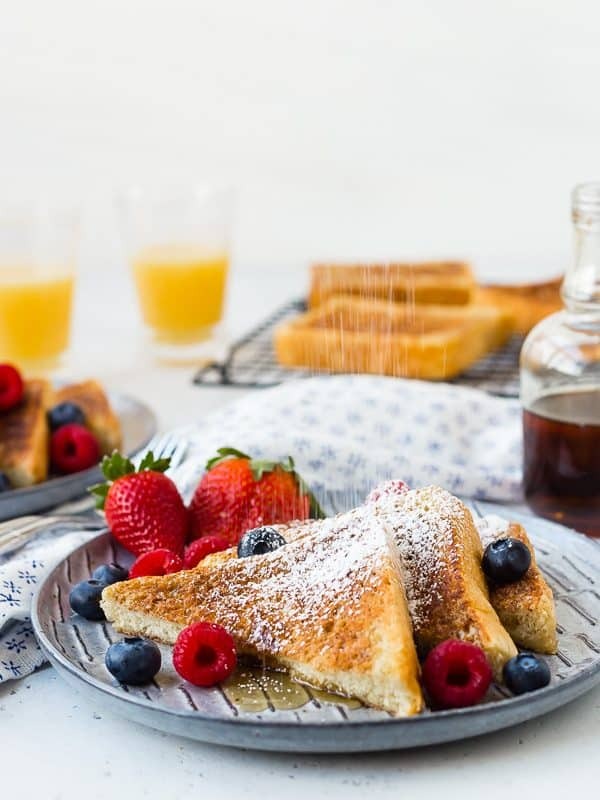 This French toast recipe is everything you want in a classic piece of French toast. 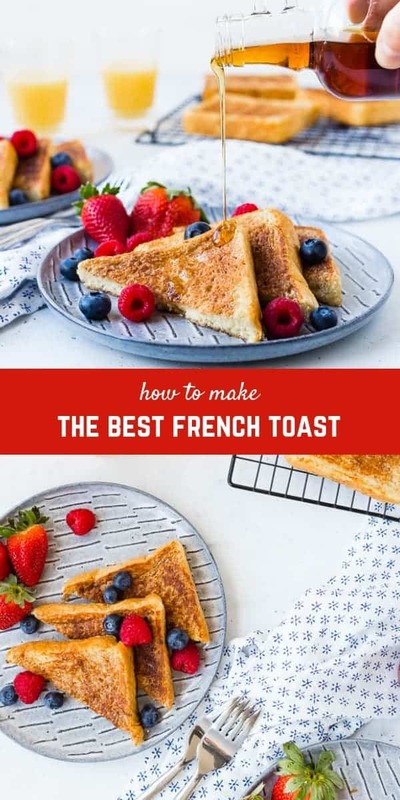 Read all my tips and you'll be making the best French toast you've ever had! Topping suggestions: Maple syrup, powdered sugar, fresh berries, brown sugar, whipped cream, fruit sauce, anything you like! Beat eggs, milk, vanilla, and salt very well in a medium mixing bowl or a large measuring cup. Beat until appearance is uniform with no visible egg pieces showing. Pour into a shallow bowl that's big enough to dip a piece of bread into. In a small bowl, mix together sugar and cinnamon. Sprinkle each side of the bread evenly with cinnamon sugar mixture. Heat a flat skillet or griddle over medium heat. Place butter on pan for more flavor, to encourage a golden brown color, and to prevent French toast from sticking to the pan. 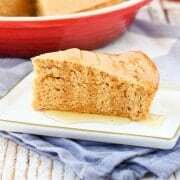 Dip a piece of bread into the egg mixture and let it soak up egg and milk mixture for 10-15 seconds on each side. Let excess egg mixture drip off before placing French toast on heated griddle. Cook for 3-4 minutes on each side or until golden brown and cooked through. Nutritional information does not include butter for the pan or toppings. Verdict: This is the perfect French toast recipe when you’re looking to achieve that classic French toast taste. Changes I would make: None are necessary, but like I mentioned, definitely have fun with different types of bread. 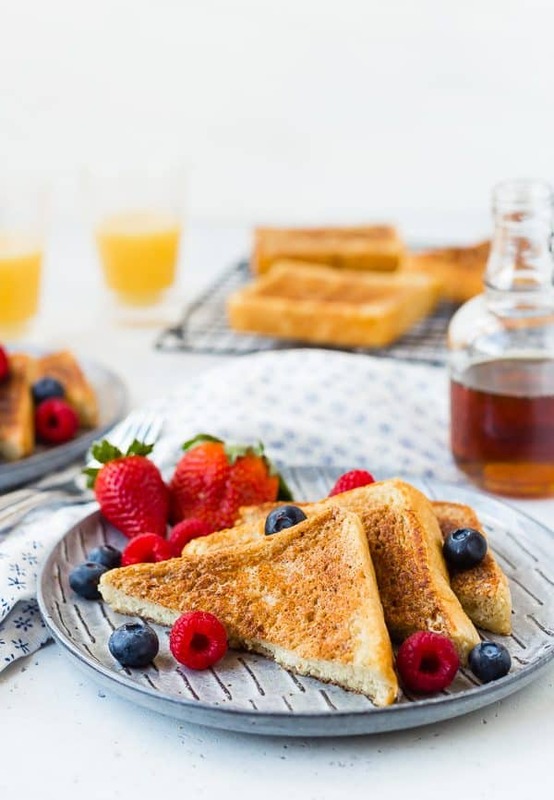 Brioche is always a winner for French toast. Buuuut….it isn’t just toast. It’s toast soaked in eggs and milk…which is french toast. Am I missing something? Sounds lovely. But, sorry, my french toast must be made without sugar etc. because I eat it with ketchup – not syrup. My British father taught me to eat it this way. 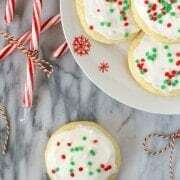 My mother occasionally cooked it for supper and he would occasionally have one last piece slathered with butter and sugar. With ketchup! How interesting – I love a savory breakfast, so I’d probably like that. Thanks for sharing!